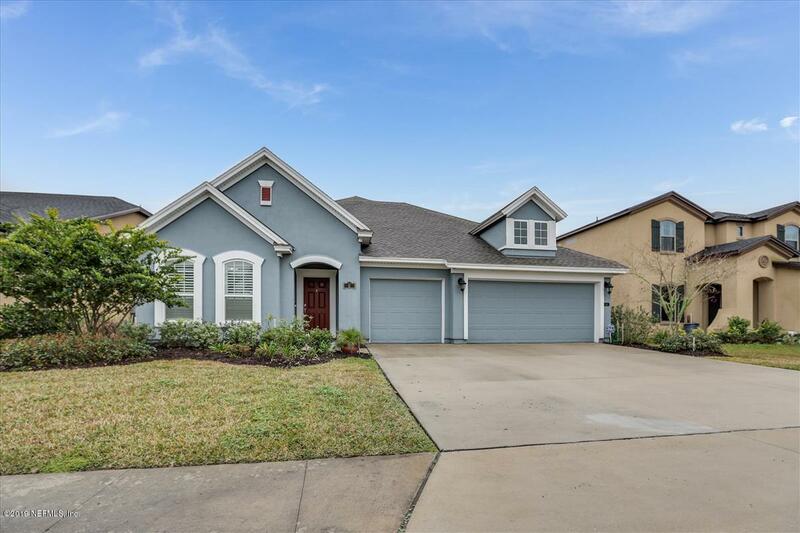 Looking for a LARGE HOME in the heart of Nocatee's VALLEY RIDGE SCHOOL DISTRICT, then this wonderful home in GREENLEAF VILLAGE is a must see! UNDER A MILE to the neighborhood PARK & ''A'' RATED K-8 Valley Ridge Academy. Features an OFFICE with DOUBLE FRENCH DOORS + 5 bedrooms. Family room is OPEN to kitchen w Natural GAS Cooktop & plenty of STORAGE SPACE. Roomy Master has a BAY WINDOW, TREY CEILING & bath w SUPER SHOWER. Guest room has EN-SUITE bath. BR 3 & 4 share a bath. Upstairs is BONUS ROOM+Bedroom #5 w WALK-IN closet & full bath. Looking to entertain? The beautiful EXTENDED & SCREENED LANAI with SUMMER KITCHEN will wow your guests. Electric for Lanai TV in place. TANKLESS gas water heater. FENCED back yard. Fridge, washer & dryer STAY! Quality DAVID WEEKLY construction.